Two weeks ago, Big Ideas Learning met with administrators in Michigan for the Big Ideas Math Symposium. Teachers and Administrators had the opportunity to meet and talk with authors Dr. Ron Larson and Dr. Laurie Boswell as well as meet and talk with Denise McDowell, Barb Webber and users of the Big Ideas Math program. 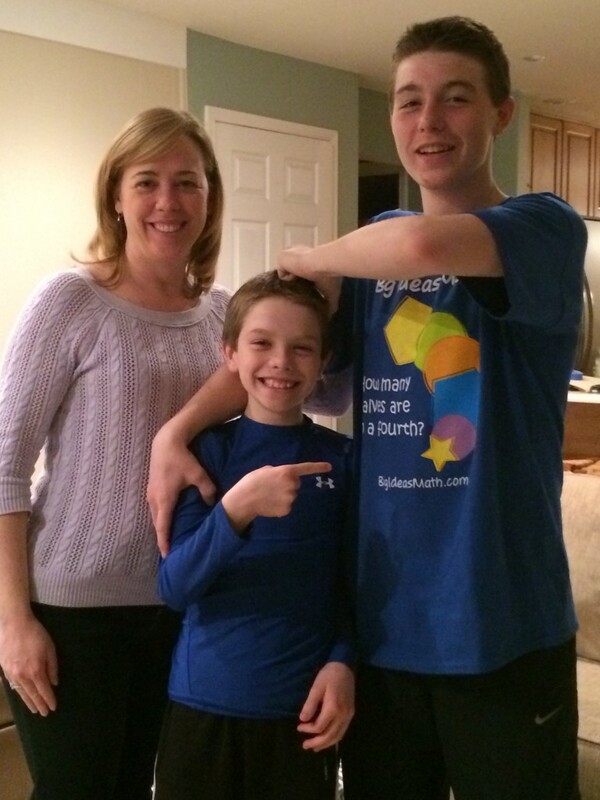 Thanks for the great story and even better picture, Cherie! Do you have a story about the Big Ideas Math program? Let us know in the comments below! Posted in Conferences + Events, News	| Tagged Big Ideas Math, Common Core, Common Core State Standards, Depth of Knowledge, Questions + Polls, Standards for Mathematical Practice, teachers	| Be the first to comment! 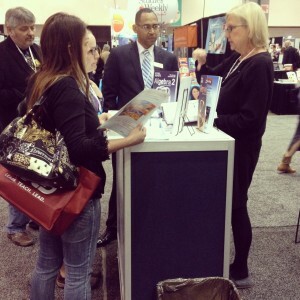 We had a fabulous time exhibiting Big Ideas Math at the ASCD 69th Annual Conference & Exhibit Show in Los Angeles, California on March 15th. We would like to thank all of you that visited our booth, shared your stories and brightened our days with your Big Ideas Math stories and experiences. This year we offered a sneak peek of our NEW High School Series (Algebra 1, Geometry, Algebra 2) making its official debut at NCTM in April. We received a lot of interest and excitement for the series. In case you were unable to attend the conference, here are some pictures from the conference! We hope to see you at the 2014 NCTM Annual Meeting & Exposition in New Orleans. Look for our booth, booth number 1718. If you would like more information about the NEW High School Series, please contact us! 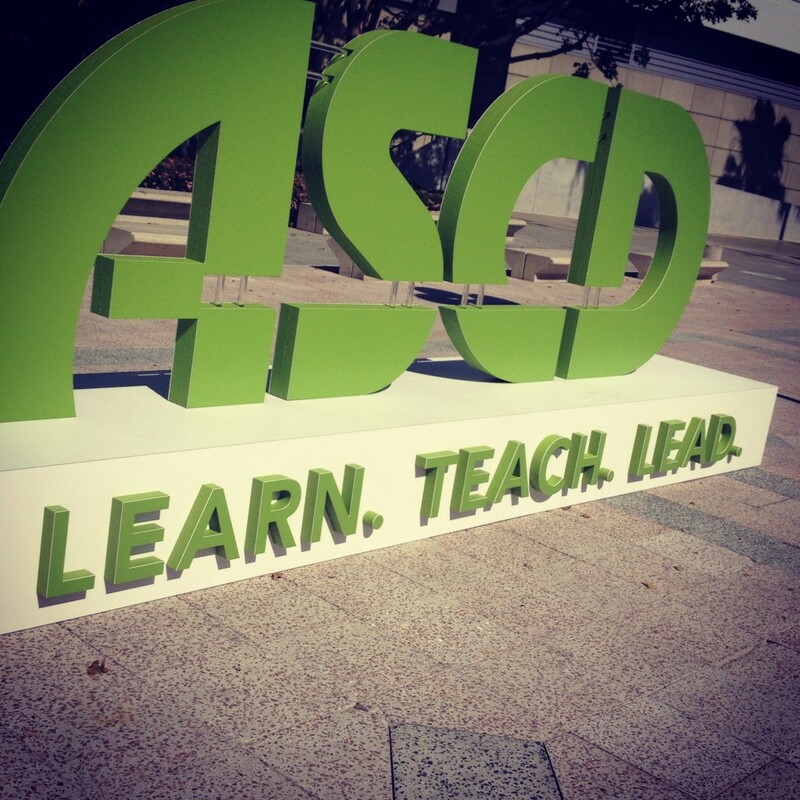 Posted in Conferences + Events, News	| Tagged ASCD, ASCD 2014, ASCD Conference, Big Ideas Math, California, High School Series, Los Angeles, NEW	| Be the first to comment! Response to Intervention (RTI), a framework for modifying instruction based on early evaluation of student-learning needs, is gaining traction in schools. The Big Ideas Math program completely supports the 3-tier model. Using research-based instructional strategies, Big Ideas Math helps teachers reach, challenge, and motivate each student utilizing the three tiers. Opportunities for daily assessment help identify areas of needs and easy-to-use resources are provided to support the education of all students. 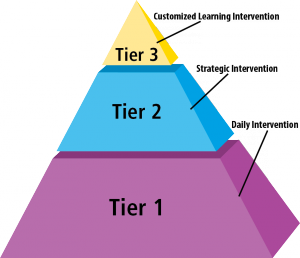 Following Big Ideas Math’s 3-Tier RTI, you will be able to set your students up for success in the classroom. The Big Ideas Math program uses research-based instructional strategies to ensure quality instruction. Vocabulary support, cooperative learning opportunities, and graphic organizers are included in the Pupil Edition, with additional strategies throughout the program. Daily student reviews and assessment guarantee that every student is making regular progress. Complete support helps teachers personalize instruction for every student. The Big Ideas Math program facilitates increased time and focus on instruction for students who are not responding effectively to Tier 1 intervention. The program’s ancillary materials include additional support to assist teachers with the needs of these struggling learners. Such examples include Fair Game Reviews, Graphic Organizers, Study Tips, and Real-Life Applications. These supplements help to enhance learning and engage the diverse students within today’s math classrooms. Additionally, using the classroom and online resources provided, teachers can reach, challenge and motive each student with instruction targeted to their individual needs. Using the classroom and online resources provided, teachers can reach, challenge, and motivate each student with germane, high-quality instruction targeted to their individual needs. In Tier 3, support for students working below grade level is also available by employing the intensive intervention lessons and activities offered in the Big Ideas Math series. The Differentiating the Lesson guide provides teachers with both an overview of each chapter’s lessons and detailed notes on lesson preparation and lesson procedures, including instruction and demonstration suggestions and worksheets. The Big Ideas Math Skills Review Handbook provides complete coverage of pre-course skills including Key Concepts, Vocabulary, Visual Models and Practice Makes Perfect. The Teaching Edition contains complete Differentiated Instruction Notes, written by Master Teacher Laurie Boswell, and includes ideas on introducing and motivating the lesson as well as comprehensive notes on activities and examples. 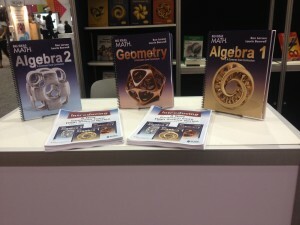 ERIE, PA – Larson Texts, Inc., a leading producer of math textbooks for sixth-grade through college calculus used by over five-million students annually, is pleased to announce that three of Dr. Ron Larson’s textbooks have received awards from the Text and Academic Authors Association (TAA). Calculus: Early Transcendental Functions 6th ed. and Pre-Calculus 9th ed., by Dr. Ron Larson, are winners of the 2014 McGuffey Longevity Award, recognizing textbooks whose excellence has been demonstrated over time and have been in print at least 15 years. 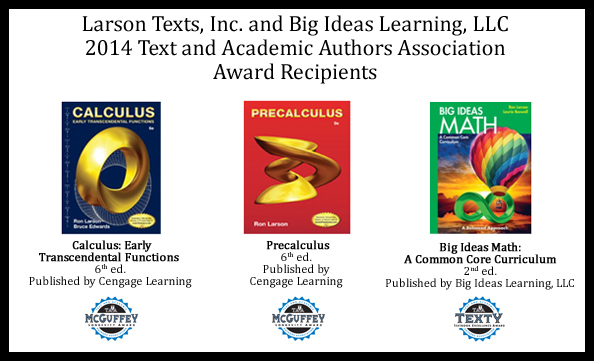 Big Ideas Math: A Common Core Curriculum 2nd ed., by Dr. Ron Larson and Dr. Laurie Boswell, has received the Textbook Excellence Award (“Texty”) recognizing excellence in current textbook and learning materials in their 2nd edition or later. The awards presentation will take place at TAA’s 27th Annual Textbook & Academic Authoring Conference in Baltimore, Maryland on June 21st. For more information about these titles and all of Dr. Ron Larson’s programs, please visit the Larson Texts, Inc. website.